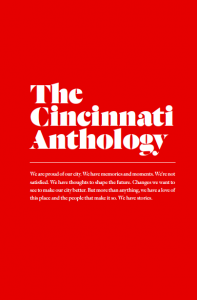 The Cincinnati Anthology brings together some of Cincinnati’s most notable residents, native sons and daughters, creatives, and contemplators to tell tales of a city’s triumphs and tribulations. The work included — essays, art, and photography alike — reflects the complexity of the city: its present and its past, its transition and its legacy; what defines it and distinguishes it; what makes us love it and what makes some eventually leave it. It is an anthology on genealogy and geology, race and progress, and experiences from the suburbs to Over-the-Rhine. With essays, photographs, and art from Curtis Sittenfeld, Katie Laur, David Falk, John Curley, Cedric Michael Cox, Polk Laffoon IV, Over The Rhine, Jack Heffron, Sam LeCure, Michael Wilson, Rebecca Morgan Frank, Scott Devendorf, and many more. Zan McQuade is an editor, writer, photographer, translator, and baseball enthusiast living in Cincinnati, Ohio.